Hardly anyone in the history of Russo-Korean relations has had as much an impact on Korean daily life as Afanasy Seredin-Sabatin. Afanasy Seredin-Sabatin was the only European architect and engineer permanently living in Korea during the two crucial decades of the late 19th century, when Western architecture and civil engineering were first introduced into the country. He should be described as the man who began to build modern Seoul. Not much was known about him until recently, even though his role in the emergence of modern Seoul was always highly appreciated. Fortunately, in recent years we learned more about Afanasy Seredin-Sabatin, largely because of the research of Professor Tatiana Simbirtseva. An architect and engineer, Seredin-Sabatin possessed formal qualifications in neither discipline. Born in 1860, Seredin-Sabatin graduated from a naval academy but never served in the military. He spent a few years in the merchant navy, and in 1883, found himself in the Korean port city of Incheon. By that time, he was already married (and in due time the couple would have six children). At that time, Incheon was among three Korean ports to be opened to foreign trade and settlement. Seredin-Sabatin found a job as a construction manager. In this capacity, he supervised the construction of the local office of Meyer & Co, one of the first Western companies to operate in Korea. This two-floor brick building did not survive, but is mentioned in countless books as the first European-style structure to ever be built in Korea. 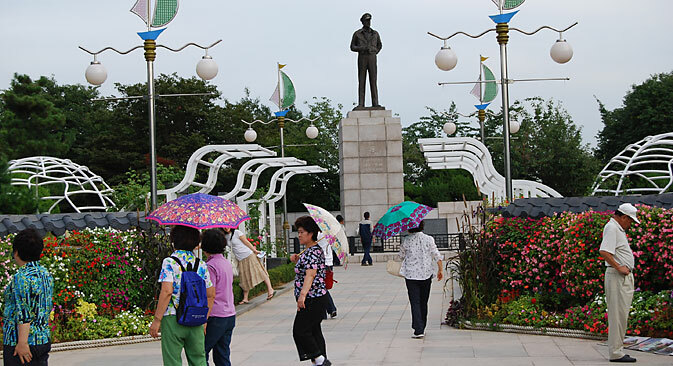 Around the same time, Seredin-Sabatin also designed the first modern public park in Korea (now Freedom park in Incheon). When Russia established diplomatic relations with Korea in 1884, Seredin-Sabatin was commissioned to design the building of the Russian mission as well. Only the tower of this building has survived the ravages of time. He also developed good relations with King Kojong, frequented the royal palace, and was a witness of the assassination of Queen Min by Japanese agents in 1895 (he seems to be the only witness who left records of the event). Throughout the 1890s, Seredin-Sabatin worked on several important projects. He was responsible for the structural design of the Dongnipmun (Independence Gate), which is still seen as the most important architectural symbol of Korea’s independence and modernity. For a few years, Seredin-Sabatin was also employed as the Korean royal court’s architect. In this capacity he introduced Western-style brick and stone buildings into Korean royal palaces. Among other structures, he designed the building for the royal library in the Doksugung Palace. The building did not survive, but a reconstruction will come up at the original site soon. Around 1900, Seredin-Sabatin quit his job and began to switch from architecture and construction to more traditional types of business. He worked as a trade representative for railway and shipping companies, and also occasionally wrote for Russian newspapers and magazines. The last building he constructed in Korea was the Sontag Hotel in Seoul, which was the first modern hotel to have ever been built in Korea. Like the vast majority of Russian subjects in Korea in those years, Seredin-Sabatin permanently left the country in 1904, after the outbreak of the Russo-Japanese War. He lived in Vladivostok for a few years, but then, for some unknown reasons, deserted his family, divorced and moved to the western part of Russia, where he spent the rest of his life. Seredin-Sabatin died in 1921, soon after the end of the Russian Civil War. Some of his descendants eventually moved to the US, while others still live in Russia.